It's hard to believe that the dig is almost over. Many thanks to all the crews over the last four weeks, including this happy bunch. our last day at the site. We try out a new venturi. but John gets quite wet. We clean the site carefully. that Nick can map them. Today was hot, and we could see plumes of smoke from the bushfires on Wilson's Prom. We found very few fossils, but our brave and stout-hearted crew persevered. Fotini attacks a rock with gusto. Dave moves in for a consult. We are still looking for a really creative way to rid our hole of the vast amounts of seaweed that accumulates each night. We try raking and scooping and bucketing and wheelbarrowing. This week the girls got to play with the boys' toys. to place the plugs and feathers. Then Lisa and Cate got to work. the spirit. What an action shot! Hurray - a mammal jaw at last! After nearly two and a half weeks the first mammal jaw for the season turned up! Found by our very lovely Jacqui Tumney, it is a handsome specimen with at least 7 teeth. David Pickering (Museum Victoria's Collections Manager) thinks it could be an Ausktribosphenos nyktos. More will be revealed after further preparation at the Museum. 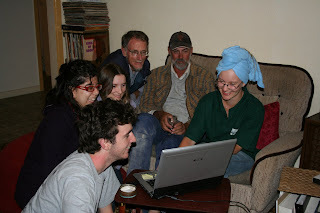 Week 3 crew are a very happy bunch. Seen here in the back garden of the "dig" house in Inverloch. "Friends" joined us at the site. It was a great day. length, we are not yet sure what sort of bone it is. Week 2 crew on site. Hard to believe it had been 43 degrees C only a few days earlier. Absent is Alan Evered (again) and Gerry Kool (photographer). Thanks to the generosity of Wal and Tim Edgar and John Volk from Total Tools in Cranbourne, Victoria (03 5995 7411), Dinosaur Dreaming became the proud owner of a new drill and generator. 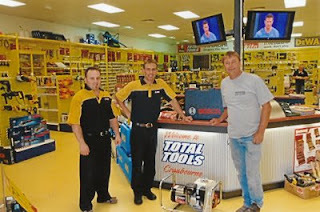 Pictured is Tim and Johnat at the Total Tools store in Cranbourne donating the drill and generator to John Swinkels, one of the Dinosaur Dreaming team. Here is the new drill in action. Excavator, Nick van Klaveren tested the drill on the shore platform and declared that it really did the job. The holes were drilled for the plug and feathers, featured in the first week of the dig. A 360 degree panorama view from site courtesy of Kat. 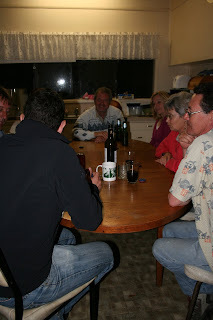 we break rock at the rented house in Inverloch. out one of the fossil bones in our "prep area" in the shed. The one on the left was broken prior to deposition. 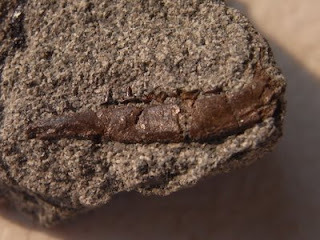 from one of the small ornithopod dinosaurs.